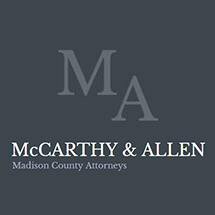 The McCarthy & Allen law firm in Glen Carbon, Illinois, represents clients in real estate law as well as construction law, business law, family law, estate planning and probate. With more than 50 years of combined experience, our lawyers provide personalized legal counsel in transaction and litigation matters. Our law firm is dedicated to providing outstanding client service. We offer attentive and accessible representation, working closely with clients to understand their particular needs, concerns and goals. Additionally, our law firm values clear and prompt communication. Our lawyers are accessible and responsive to clients'concerns. To better serve clients, we offer cost-effective consultations as well as flexible appointments. At McCarthy & Allen, we provide experienced and attentive representation for individuals, families, businesses, contractors and subcontractors, developers and nonprofit organizations. We also assist businesses and nonprofit organizations with formation, ongoing legal needs and dissolution. In addition to our real estate practice, we offer comprehensive representation in family law, divorce, guardianship and probate matters, including those involving large and complex estates. We also offer estate planning services to assist families with preparing for the future.